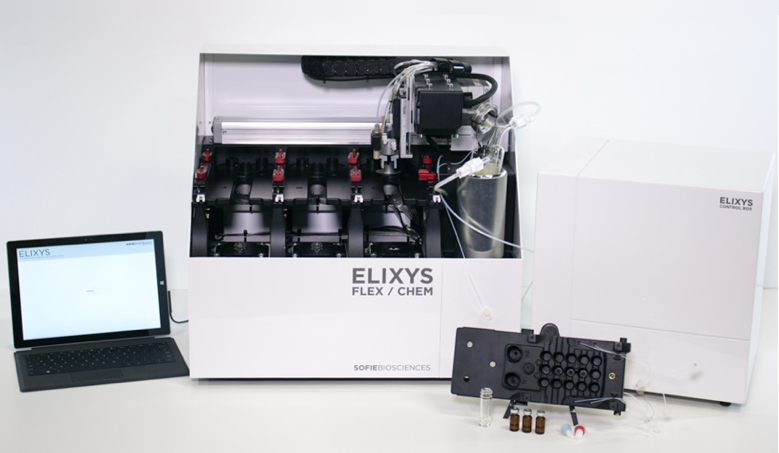 ELIXYS FLEX/CHEM is an automated radiochemical synthesizer for the production of preclinical and clinical PET probes. A single platform solution for R&D and production, you can build new syntheses from scratch, and then routinely perform your optimized protocol. It’s the best of flexible and fixed systems, without painful re-plumbing to move between syntheses. It’s also the first of its kind – a fully integrated, three–reactor radiosynthesizer. We designed it to meet the challenging, multi–pot synthesis conditions, but you can also use it to perform three, one–pot syntheses back–to–back–to–back. We’ve spent a lot of time in the details: reduction of tubing and valves, intuitive, chemist–friendly software, and disposable cassettes that are simple to load and remove. From the most seasoned radiochemist to brand new technicians, ELIXYS is easy to learn and operate. For the same cost as a single reactor system, we think ELIXYS is the better choice for limited space and resources. A companion purification and formulation module to the FLEX/CHEM. Measuring just under 20 cm (8 inches) in width, PURE/FORM delivers new capabilities to the ELIXYS platform in a small footprint. The module interfaces with your existing ELIXYS system, with zero hardware or facility modifications required. PURE/FORM includes a 4-channel gradient HPLC pump, fully integrated UV and radiation detectors, multiple fraction-collection positions to streamline method development, integrated syringe pump to accurately drive probe formulation via solid-phase extraction, and automated sterile filtration of final probe. We think you should spend your valuable time modifying the chemistry, not the synthesizer. 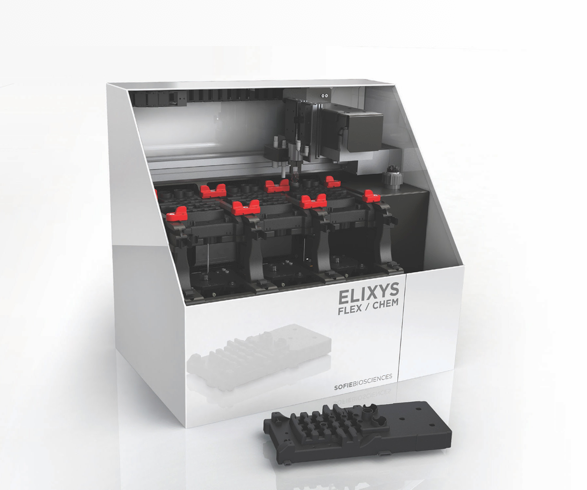 ELIXYS FLEX/CHEM and PURE/FORM’s controls are fully integrated into one intuitive package. Our software features a drag–and–drop, unit operation–based interface. With administrative controls, user defined pre–synthesis checklists and batch records, and real–time video and state monitoring, you can control fluid paths, hide detector outputs, or program the HPLC pump with ease. Interact with all graphs using smartphone-like features: finger scrolling, pinch zoom, and double tap auto scaling. After a sequence has finished, use the Analysis screen to calculate peak areas and retention times. Easily export your data as a spreadsheet to generate figures for your next publication. ELIXYS is ready for both the preclinical and cGMP environments.